If the transfer van is the silent workhorse of the funeral industry then the hearse is the racehorse everyone watches. Yet most people do not really look at it, let alone know how a hearse works. I have found people will watch the hearse, it is a fancy different car carrying a coffin. But people will not look at it properly. The watching is mostly superficial and not intense. It is as though to look too closely would be wrong. So here is the hearse revealed for what it is, just another car. Unlike America no car companies make hearses in Australia. Instead the hearse is a regular car that has been modified. Funeral homes will buy a car form the dealer, then take it to a third party car modification place, such as Hadleys, to be turned into a hearse. 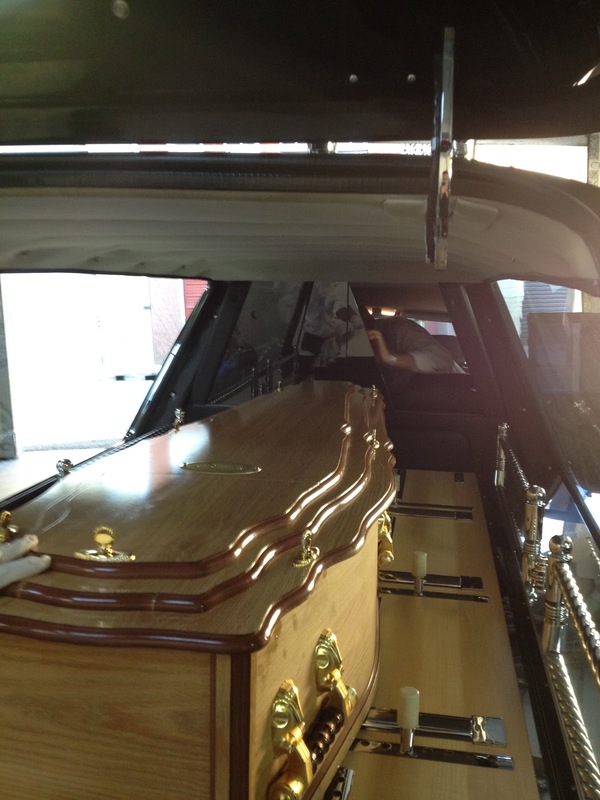 Each funeral home can make the hearse the way they want to which ensures it is individual to that company. They usually use a bottom end or mid-range car, such as a commodore, rebadged to pretend it is a top end car. They have to pay for the brand new car which can be about $40,000, then roughly another $60,000 to get it modified. All in all a brand new hearse can easily cost over $100,000 and take a month or more to make. And they do not need a fancy car for a hearse, it looks no different and costs so much more. So getting a basic car and converting it makes sense when you think about it. There are a few types of hearses in a large variety of colours from new to old. From black Holdens to white Chryslers. If a funeral home wants a specific hearse it can be made. And if the family want a specific hearse it can be found. But at their heart all of the hearses are the same. My experience has mostly been with the W.N.Bull fleet, so I will focus on those hearses. 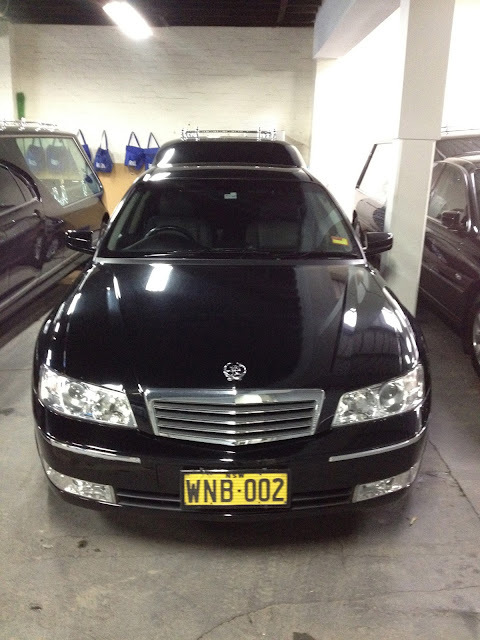 W.N.Bull has a fleet of three early 2000s Holden Statesman hearses and one 2011 Holden Commodore hearse rebadged as a caprice. This is the only company to use actual Statesman cars as a hearse and not just re-badged commodores. Although now InvoCare owns the company this policy has changed and they are now getting Commodores. Statesman hearse drivers side wing door. The hearse has a lot of space, and a lot of doors. And every hearse will have different ways to open these doors. The wing doors are the small doors on either side of the hearse that open up the space underneath where the coffin sits. Here is where we keep tables, chairs, umbrellas, a CD player, the church trolly and much more. In some hearses they have a button behind the back passenger seats, in others they have the buttons on the middle console by the drivers seat. And a few have handles on the wing doors themselves. The handle option is becoming more popular as it is easier to open. If the wing door gets stuck, which happens a fair bit, or is on a slope and liable to hit something if it swings open then it is a two person job. One will press the button while the other stands by the door and makes sure it opens correctly. 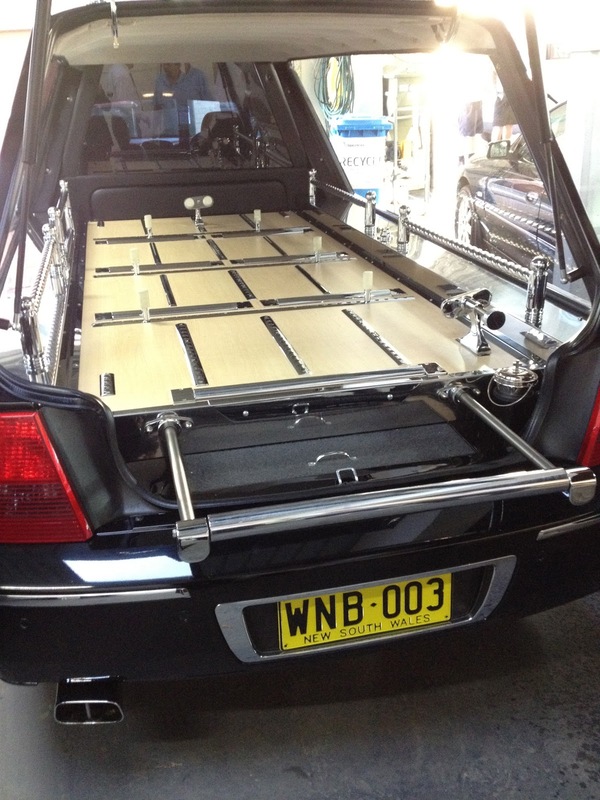 Whereas a hearse that has handles on the wing doors can be opened by just one person in these situations. The down side is many find the handles to be unappealing and I have heard it costs more. The rear (or boot) door that opens to the coffin can be opened in many different ways. Some will have a button by the drivers seat, like many boot doors. Others have a button under a wheel arch or by the back number plate. - The gooseneck; is the device used to keep the coffin in place. It is a simple chrome piece that slots into two holes and is then tightened. 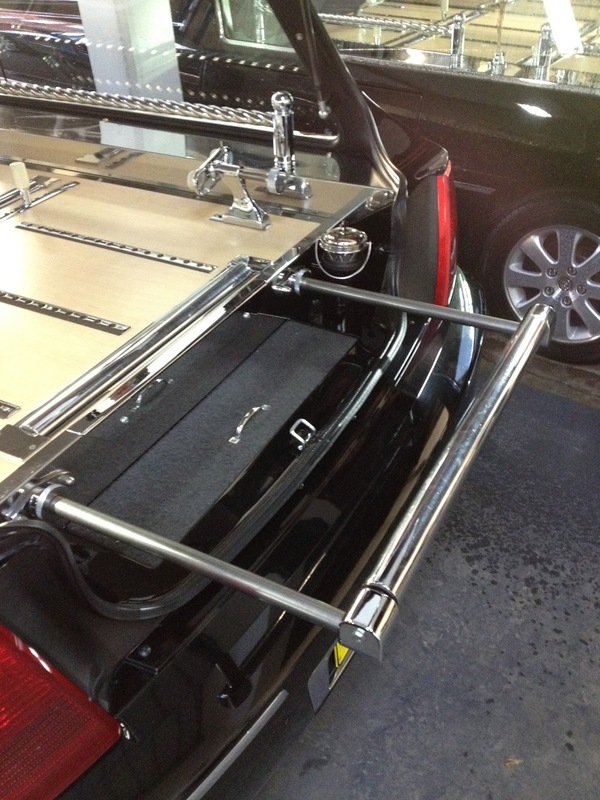 - The bar; is an extendable bar at the back of the hearse. The foot of the coffin is placed on this as it is slid in or out of the hearse. - Wing doors; are the small doors on either side of the hearse that open up the space underneath where the coffin sits. - Duel cab; refers to the number of seats. A duel cab hearse has four passenger doors and is much longer than a two door hearse. All photos were taken with an iPhone, so excuse the low quality of some. Caprice hearse rear. You can clearly see ordinary commodore mud flaps and tail lights. Caprice hearse passenger side wing door, with protective carpet down. Inside the statesman hearse wing door. Inside the passenger side wing door, with protective carpet up. Inside the caprice hearse wing doors. Button to open the wing doors in the caprice hearse. From inside the hearse, looking into where the coffin sits. Inside the statesman hearse cabin. Back seats inside the statesman hearse cabin. The 'bar' on the statesman hearse. to protect the bumper and make it easier to load or unload. You can see the silver holy water container to the right at the back. crucifixes and other small stuff is kept. The 'pegs' to the side are what help aline the coffin as we slide it in or out. They can be moved in or out depending on what is needed and have rubber on the tops to prevent damage. The rollers along the bottom make sliding the coffin about easy. Straightening the foot of a coffin just after loading up. The windows separating the coffin from the cabin can be slid open to gain access to the foot of the coffin. The cabin of the statesman hearse with doors open. Back of the statesman hearse after loading. The door is always left open once a coffin is inside while the hearse is in the garage. The "goose neck" is what keeps the coffin in place. It sits at the head end (by the door) and is slotted into two holes to hold it. Then it is tightened to keep the coffin still. It is a fancy version of the same thing used in the transfer cars to keep stretchers in place. The Caprice hearse outside a church in Waverley. The caprice hearse open, ready for the coffin to come out of the church. Returning home after a rainy day. The family had scattered frangipani flowers on top and inside the hearse. Buying a used car doesn't have to be risky. If you know what you want then it becomes a lot easier.